You can't forget a distinctive name like Hilkiah Bedford, and so this is a very well known name in the world of clockmaking, mostly by virtue of being unusual. His work however is much less well known, and I was delighted recently to come across this fine sundial signed by him as 'H. Bedford in Hosier Lane'. It is an ordinary horizontal sundial such as any gentleman might have in his garden or courtyard, but we might expect that a sundial by Hilkiah would be not quite 'ordinary'. A garden sundial was made at this time not just for the fun of seeing what time it was as you strolled round the garden. It had a more serious purpose in being the only way of setting the time on your clock or watch. It was there to enable to owner to read the sundial time, then to set the clock add or subtract a little to allow for the time of year as set out on an Equation of Time table - which probably came with your clock or sundial. At the time this sundial was made a clock was no use without a sundial to set it by, and it is believed that a clockmaker would normally have supplied a client with a sundial along with his clock. We cannot be sure whether the clockmaker himself made the sundial or whether (and this is the more likely) he would have obtained that from a specialist maker of sundials, who was usually a maker of all kinds of measuring devices known as a Mathematical Instrument Maker. Clocks were costly items and tend to have been preserved for centuries, in more recent years by collectors. Sundials have had a much lesser following and very many must have been destroyed as obsolete in the last century or so, as modern time signals made them superfluous. 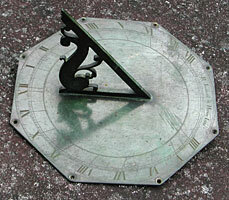 This can often mean that sundials are scarcer than clocks by the same maker or of the same era. It was only in 2002 that a man walked up to the counter of a London auction house holding a carrier bag full of odds and ends he had gathered from his attic in the hope that there might be something of value amongst them. The assistant was astonished to find amongst them a horizontal sundial by no less a maker than Thomas Tompion. It was subsequently sold for not much under £50,000.00., as barely a handful are known by this very famous maker and most of those have been for years in historic homes. The Equation of Time is the difference by which solar time varies from the mean (=average) time of the twenty-four-hour day by which we run our clocks. The amount varies between plus and minus about sixteen minutes according to the time of year, for on only four days a year do they coincide - in April, June, September and December. At all other times the clock is either slow or fast when compared to the sun's time. Scholars had long known of this variance but it is believed to have been first published in the form of a table at the time when the pendulum clock first appeared, that is about 1658, and by no less a person than Christian Huygens, himself inventor of the pendulum clock. Others published their own Equation Tables later and by the early 1660s it had become essential to use a sundial to set the time of a pendulum clock. Before then it was less important, as a pre-pendulum clock (i.e. a balance-wheel clock) will not keep time accurately and consistently enough to worry about such a time variance. 1. The full ten-inch sundial signed 'H. Bedford in Hosier Lane', which can be dated between 1663 and 1664. 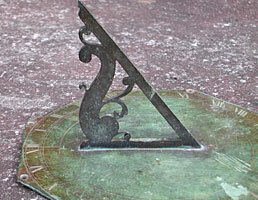 A sundial will commonly show divisions around its surface of hours, half hours, and quarter hours. Some will split the quarter unit into two, to show what was at that time called a 'half-quarter' (i.e. a 7 1/2 minute unit), which was the smallest unit of time you could conveniently measure on a single-handed clock such as a lantern clock. Others may split the quarter into three, to register units of five minutes. In the seventeenth century sundials were seldom divided more finely than that except on very large dials. However we know Hilkiah Bedford to have been a meticulous instrument maker and it is not surprising to find that he divides his dial plate in all possible ways to suit all users. His inner divisions run to hours, half hours, quarter hours and 'half-quarters'. Around the outer edge however he divides the hour into six, showing units of ten minutes. This is an unusual way of dividing, though I did once come across a lantern clock with its dial divided into thirds (twenty-minute divisions). He then sub-divides his sixths (ten-minute units) into five to produce the smallest units you could actually see on a dial of this size - at two minutes each. Thomas Tompion's twelve-inch sundial of about 1705, mentioned earlier, also splits the hours into one-minute units and also includes an Equation of Time table engraved in its centre, which too is calibrated in units as small as one minute. A larger twenty-one-inch sundial by Tompion also reads to single minutes, easier to read on such a large dial than on a smaller one. On Hilkiah Bedford's sundial the XII numeral has the X and II separated by a small gap of several 'minutes' distance. This is to allow for the shadow of the thickness of the gnomon. Coming up to XII you read the shadow on the left of the gnomon; after XII you read that on the right. It was normal for good sundials to have this space, otherwise there is a time around noon when the time cannot be read at all because the scale is in total shadow caused by the thickness of the brass of the gnomon. Tompion later did the same with his sundials. Hilkiah Bedford is believed to have been born about 1632 in Sibsey near Boston in Lincolnshire, the son of Thomas Bedford, 'gentleman'. He was apprenticed in London in 1646 through the Stationers' Company to mathematical instrument maker John Thompson (who had premises in Hosier Lane) and completed his time with him in 1654, when he was made a Freeman of that Company. He may well have worked on under John Thompson's mastership to complete his two years as a journeyman, something which was expected of apprentices but was not always complied with. He made precision instruments of various kinds - rules, quadrants and sundials, including portable universal ring dials as well as those of the horizontal 'garden' variety. Instrument makers were usually engravers as well and it is likely that this sundial was actually engraved by Bedford himself. He took other apprentices through the Stationers' Company between 1656 and 1671. Recent research by Anthony Turner has shown that Hilkiah married in April 1656 to a fourteen-year-old girl named Mary Gardiner. The date of marriage of a freeman often co-incides with the date of starting his own career, which again makes this look like 1656. Mary died in 1682; Hilkiah died on 6th May 1689 and was buried at St. Dunstans in Fleet Street. Strictly speaking the Clockmakers' Company controlled the trading standards not only of clockmaking but also of those who made sundials and rulers and such items as yardsticks, which they called canes - those who sold them were known as 'cane sellers'. Since its founding in 1631 the Clockmakers' Company had always carried out regular 'searches' by senior members, who would enter unannounced into the premises of anyone in the trade, by force it necessary, to uncover, confiscate and deface inadequate work in clocks and watches. They described their searches as the 'walks' or 'four walks'. Hitherto however they rarely bothered themselves much with items sold by mathematical instrument makers, most of whom belonged to other City Companies, which were formed earlier than the Clockmakers. Following the heavy costs caused by the Great Fire of London in 1666 all City Companies were desperate to raise funds by whatever means were open to them and this probably why the Clockmakers' Company had a massive purge in 1666 to 1667, resulting in their forcing many mathematical instrument makers, already members of other Companies, to join the Clockmakers at the meeting of 24th February 1668. At that meeting something like twenty instrument makers joined, amongst them, Hilkiah Bedford. Being members already of other Companies, these new members could not become Freeman of the Clockmakers but could only join in the lesser state of 'Brothers'. It is probably a mark of Hilkiah's standing in the Company that, despite being only a Brother, on the very first search of the premises of instrument makers in April of 1668, it was he who carried the standard measuring stick, made of brass, against which all others were checked. 2. Profile of the original gnomon of dial. It is interesting that it survives as so many of this period have been replaced from damage. The Company would confiscate or deface any faulty measures, and accuracy was insisted upon. For instance in 1671 they seized amongst others from 'an ironmonger in Foster Lane 2 plain joynt 2-foot rules & 5 plaine 2 foot rules, 4 being tipped & 1 untipt'. Those who sold measures might be shopkeepers of all kinds, but were principally ironmongers and 'canesellers' (i.e. sellers of rulers and the like). One caneseller was Charles Danley, who worked 'at the Sign of the Grape in Fleet Street over against Mr. Bedford'. In 1672 Hilkiah was described as residing 'not far from Charles Danley at the Sign of the Grape'. That was the occasion on which some faulty sundials were confiscated from Danley - probably by Hilkiah Bedford himself, confiscating sundials from a rival trader who was in competition only a few doors away! No mercy was shown as the controllers were punctilious in the matter of measurements. In 1673 the searchers confiscated a two-foot rule from 'Mr. Harris, an ironmonger, because it was one tenth of an inch too long'! On these same walks they would also attempt to collect any unpaid 'quarterage' money from members, who were usually expected to pay a subscription of four pence a quarter. The searchers would be obliged to stop occasionally at a tavern for liquid refreshment, and it was probably as a result of this that there were occasional mishaps. In one instance Warden Samuel Horne had an unfortunate experience, but reading between the lines it seems the whole group were confused to say the least. 'In Chancery Lane Warden Horne lost the search paper, when there had been rec'd 13s 6d, whereof it was remembered that there was rec'd of Mr. John Harris 3s 4d and of Mr. Barlow Rooks 3s 4d. But it was forgotten of whom was the other 6s 10d.' We can assume there was no intemperance when Hilkiah Bedford carried the measure, as he was from a Quaker family and no doubt a man of great sobriety. Hilkiah Bedford's first premises were 'at the Sign of the Globe near Holborn-Conduit', where he is believed to have worked from his first setting up in business on his own (about 1656) till 1663. He is then believed to have moved to premises in Hosier Lane near West Smithfield, where he is believed to have worked from 1663 till 1666, when he was driven out by the Great Fire. Oddly enough his old master John Thompson had worked in Hosier Lane, and one cannot help but wonder if he moved back there temporarily either to share Thompson's premises or to succeed him there. In any event the Great Fire changed all that and thereafter he took premises in Fleet Street 'near the end of Fetter Lane'. Some of this information comes from records left by his son, Hilkiah Bedford junior, who was born in 1663 and became a celebrated scholar and 'nonjuring' churchman at St. John's College, Cambridge. One suggestion is that The Globe and Hosier Lane were different names for one and the same premises, but I don't think this can be correct, as Hilkiah signed his work in these two different ways. In fact both Hosier Lane and the Globe were burned down in the fire. Several items are known by him signed at the Globe. The only item I know of signed by him at Hosier Lane is the sundial pictured here and we can pin this down very closely between 1663 and 1666. As few sundials would be made during the Great Plague of 1665 or the Fire of London in 1666, it looks like it could have been about 1663 or 1664. 3. The signature in detail 'H. Bedford in Hosier Lane'. From 1668 Hilkiah Bedford also bound apprentices through the Clockmakers' Company - we know of at least three. Apart from its own interest in being the date of the instrument makers were forced to join the Clockmakers Company, we can deduce that, although he made instruments including sundials before this date, we can safely say that he would not have got away with making clocks. After 1668 no doubt he took advantage of his brotherhood of the Clockmakers' Company to make clocks too - or at least to sell them. We do know that he did make or sell clocks, though probably very few. The only one I know of his was a lantern clock sold at Sothebys in Chester in 1988. I also know of one other lantern clock, now with a spring-driven movement. A bracket clock is also recorded by him, though I have no details of that. So we can safely say that his clocks will date later than 1668, and sure enough his only surviving lantern clock is signed 'Hilkiah Bedford in Fleet Street Londini'.